The Georgia Department of Economic Development (GDEcD) is a department of the State of Georgia (United States). The department plans, manages and mobilizes state resources to attract new business investment to Georgia, drive the expansion of existing industry and small business, locate new markets for Georgia products, inspire tourists to visit Georgia and promote the state as a top destination for arts events and film, music and digital entertainment projects. 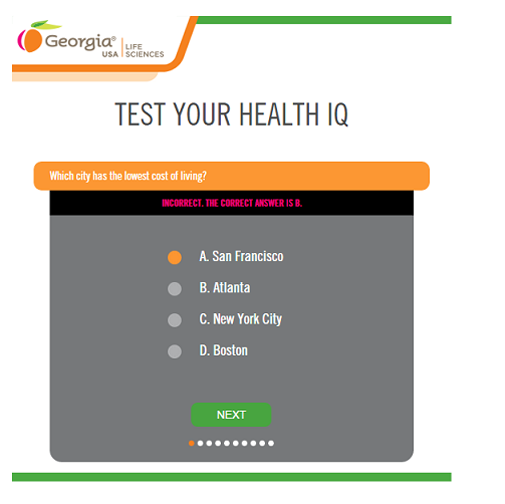 Georgia wanted to create a fun and interactive means of educating citizens about the Health IT assets that Georgia has to offer. Participants should take the quiz on any desktop or mobile device of their preference, as well as share scores on their favorite social media channels. TechCompiler designed a user friendly responsive web application which provided Health IQ Test to cater to GDEcD vision. 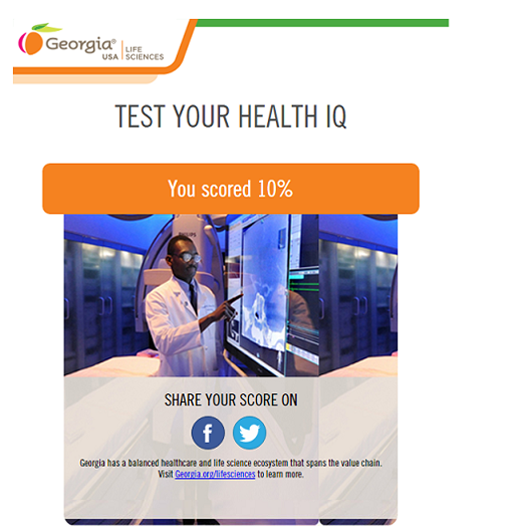 Participants were able to take the Health IQ Test on any desktop or mobile device of their preference, as well as share scores on their favorite social media channels like Facebook, Twitter and google+. Java Persistence API frameworks like Hibernate. This system is a responsive web application, users can take the quiz on any desktop or mobile device of their preference, as well as share scores on their favorite social media channels like Facebook, Twitter and google+.